Monday, December 31st, 2012 . We swept the charts and came in at #1 BEST productivity app 2012 on All My Faves thanks to all of YOU who voted for us! Thank you for LIKING us and making this win possible!!!! Friday, December 21st, 2012 . How does one overcome creative block? Our Creative Director and cofounder here at UberConference, Alex Cornell went and asked the most creative and inspiring people he knew and wrote a book about it called Breakthrough! : Proven Strategies to Overcome Creative Block and Spark Your Imagination. 1. Working in a fast-paced environment helps you eliminate unnecessary distractions or hurdles. We’re on fire over here at UberConference and this dude does quality work fast! 2. Make the stakes high. Alex recommends going somewhere, getting an expensive hotel and holing up for the weekend to just push through and do the work. You’ll be spending some money so you’re going to make it count. 3. If you find yourself stuck, let it go and come back to it later. Sometimes hurdles resolve themselves after a while. 4. Take a break. Walk around and clear your mind. It’s important to just step back a bit when needed. 5. Putting random sentences together in a book can help you come up with creative visualizations for campaigns or writing. Very effective at reworking the mind (there’s an example of how one does this exactly in the podcast). *Also available at Barnes and Noble, Urban Outfitters and various independent bookstores. Thursday, December 20th, 2012 . Just in time for Christmas. The brand new UberConference Android app has hit the Google Play store. We’ve created this and the brand new iPhone app with some great features. First, the app finds the contacts already in your Android and adds them into your conference call for you. You just click on the person’s name to add them to the call. Notice you can add several of your contacts to the call at once. You can also instantly dial out to everyone who should be on the conference call with you. UberConference will dial all numbers associated with the person you select. Creating calls is lightening fast! Just choose who you want to invite and click “Start a New UberConference”. That’s it! The system will automatically call participants to join the call right then. At the end of each call you’ll receive a summary with interesting stats. Signing in is super easy. If you have already signed up through the website you can just sign in with the same email and password (or your social media profile of choice) to the Android app. Signing up on the app is easy to do, too. Never used UberConference before? Just put in the email and password you want and then choose the social networks you’d like to connect with. UberConference is integrated with all of the major social networks. Just click on any participant on the call and bring up their information from Facebook, Twitter, LinkedIn, and Google+. While on an UberConference call, you have access to an array of in-call controls. As the conference creator you can mute, hang up, block or “earmuff” selected participants at any time during the call. You can also start and stop call recordings. Monday, December 17th, 2012 . 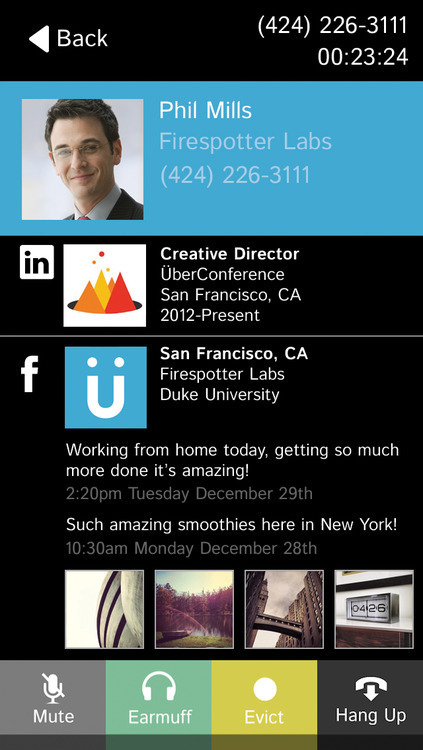 UberConference iPhone and Android apps are here! Visual conference calls on your phone? There is an app for that. And it’s free! We are excited to announce the release of iPhone and Android apps for UberConference. The new apps have the cool features that make UberConference great for conference calls, and are specifically designed for the mobile experience. It’s simple to keep track of your calls, create instant conferences on the fly, and run conferences smoothly wherever you are, right from your phone. Creating an instant conference from your phone has never been easier. With the UberConference mobile apps, it’s simple to add the people you already have in your contacts to get started. UberConference will send out all the details, and there’s even the option to have the app dial out to all the participants automatically to join them into the call. No need to worry about anyone missing the message or forgetting the call. This dial out feature is part of UberConference Pro, but it’s free with the mobile apps. There are a number of useful call control features at your fingertips when you need them on your conference call; even if you spend most of the time with the phone to your ear. Turn call recording on and off. If you have earphones or a headset it’s even easier see who’s talking at any moment and take more advantage of the integrated social features to learn more about the people in the call. Just click on the participant to see more from their connected Facebook, Twitter, LinkedIn and Google + profiles. 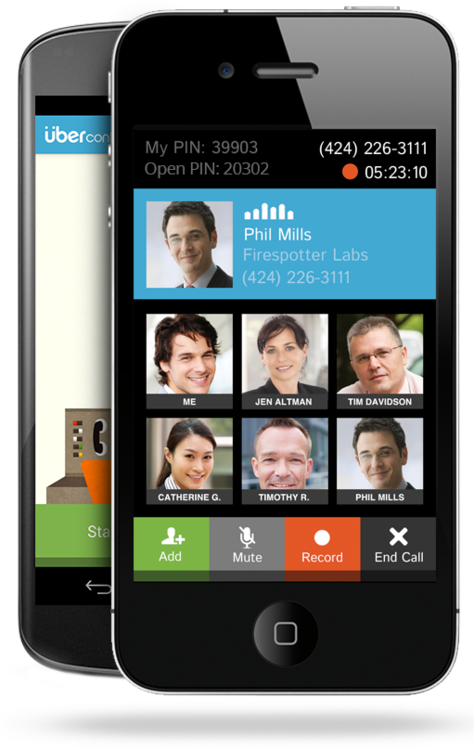 Radically improve the conference call experience from your mobile device. You’re going to love UberConference! Get the app now for your iPhone or Android phone. Friday, December 14th, 2012 . Need someone to schedule conference calls on your behalf? Until now this was only possible by sharing your password with someone. We know that’s not something most people want to do. So we changed that. Starting today, UberConference Pro users can delegate their account by creating an administrator password. This allows someone else to schedule and edit calls on your behalf. To create an administrator password, just login to your account and go to Settings>Password then click on “Invite an administrator”. Your chosen admin will get an email prompting them to create a password to access your account. They will still login with your email address but have their own password. Once created, your admin will be able to do most anything you can with your account, other than change your password. You can revoke these admin privileges at any time.